Picking produce isn’t an art, it’s a science! Once you learn theses simple tips, you’ll be a pro around the produce isle. The best place to get the freshest produce is always your local farmer’s market, where it’s simple to eat seasonally. Don’t have a farmer’s market nearby? Many grocery stores are getting hip and now stock seasonal produce from local farmers! So keep an eye out for signs in your local store as you cruise the isles. 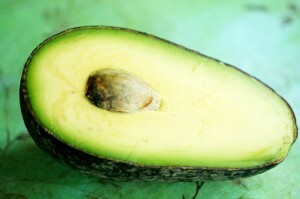 Avocados are — botanically speaking — fruit. And most fruit are best eaten when they are soft to the touch and the flesh is ripe. Gently press the rind of an avocado, it should give slightly under your finger. Most grocery store avocados are hard as rocks when you buy them. 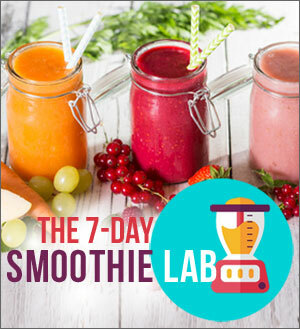 They’ll need anywhere from 2 to 3 days on the countertop to ripen, so plan ahead if you intend on making a scrumptious batch of guacamole or my chocolate avocado shake. Want to save cash and buy in bulk? Store half in the fridge to slow the ripening process or if you have too many ripe on the countertop at one time, place a few in the fridge to hold them an extra day or two. Avocados are in season winter through spring. Blueberries, like other berries, are best eaten when they are ripe but still slightly firm. Here’s a great tip to see if berries are overripe without popping one in your mouth: Turn the container over and look at the bottom. If there is any moisture, broken berries, or mold, you’ll be able to spot it. Don’t wash berries until you are ready to eat them, as washing them causes spoilage — and always store them refrigerated. Berries are in season spring and summer. Broccoli is best when the florets are firm and tightly closed. Take a peek at the end of the stalk: if it’s dry or hollow, that could be an indication it’s been on the road too long. Avoid heads that have yellowed or opened florets. 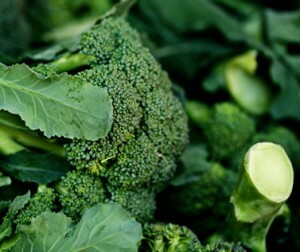 Store refrigerated in a loose plastic bag as broccoli can wilt if left uncovered in the fridge. Broccoli is in season spring, summer, and fall. Ripe Bing cherries are dark red, with a firm surface and skin, but juicy flesh. Avoid cherries that have soft or dark spots. Depending on the kind of cherries, pigments in the skin will change based on ripeness, and you’ll learn from experience which ones are ripe just by looking at them. Cherries are in season in the spring. Store refrigerated in an air-tight container. Eggplant is a fruit that’s part of the nightshade family. Italian eggplant is best when the skin is very firm and glossy and it’s firm when squeezed. You might also spy the Japanese variety (tends to be less bitter) which are lighter purple, but the same shopping technique still applies. Store refrigerated, no bag or container needed. Eggplant is in season in summer and early fall. Look for grapefruit that are firm to the touch and give their rinds a brief sniff. I find the more fragrant ones tend to have better tasting fruit. Store them in your crisper as most citrus is fairly ripe when you buy it. 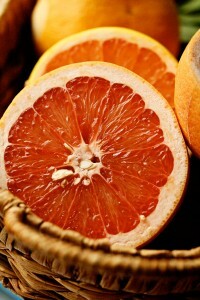 Grapefruit is in season during winter. Just a note about safety. Check with your healthcare practitioner about consuming a lot of grapefruit if you’re taking prescription drugs. Certain pharmaceutical drugs should not be combined with grapefruit juice. Medication can become more potent because grapefruit doesn’t allow them to break down, causing them to build up in your system. Hot chilies are one of my favorite fruits — jalapenoes, cayenne, and habanero, yes that’s right, they are all fruit! Chilies are best when they have shiny skins without blemishes and the chili is firm to the touch. Store them in a loose plastic bag in the fridge until ready to use, they keep for up to 1 week refrigerated. Kale is my favorite green veg, inexpensive and totally versatile. It’s best when the leaves are dark green or green and red in the case of Red Russian. 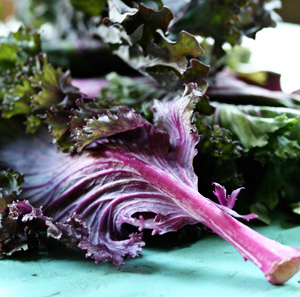 Choose kale that is firm to the touch, with no tears or yellow spots. Store kale in a loose paper or plastic bag in your crisper as kale can wilt if it’s not covered. Kale grows year-round but its prime season is fall and winter. Kiwi are fuzzy wonders that taste best when slightly soft to the touch. Store hard kiwis on the countertop for 2 to 3 days to soften, or place in the fridge for up to four weeks. Kiwis are in season winter through spring. Melons can be a bit of a mystery for most folks when it comes to ripeness. One tip is to give watermelon and other larger melons a knock with your fist. If you hear a dull thud, that’s an indication that the melons are full of ripe, water-rich fruit. It’s always a good idea to store your melons on the countertop for a few days before slicing. Also, give honeydews and cantaloupe a sniff, the sweeter the smell the riper the melon. Melons are in season late summer. Mushrooms are best when they have a dry, firm surface that’s free of dark or wet spots. They should always be refrigerated and never washed before using. Mushrooms are ready to use as soon as you buy them, no ripening required. Mushrooms are in season spring and fall. Spinach is in season spring, summer, and fall. Look for firm leaves without creases or dark spots. 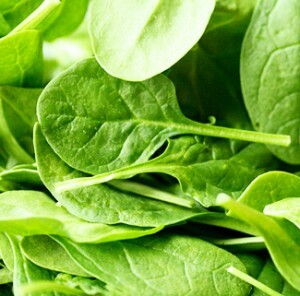 If you’re buying bagged spinach, turn the bag around and look for dark spots or decay. To keep spinach fresher longer, tuck in a paper towel to catch moisture that can damage delicate leaves. Spinach stores in your fridge for up to 5 days, but baby spinach is my preference since it’s tender and cooks in a minute or two. Mature spinach is still nutritious but can be tough and is usually grown in sand which is difficult to remove. Sweet potatoes are best when they have a firm, smooth skin and are very firm to the touch. Store them in a dark, cool place and avoid potatoes that have sprouted. Sweet potatoes are available year-round but they are in season fall and winter. Wondering if you should go organic? 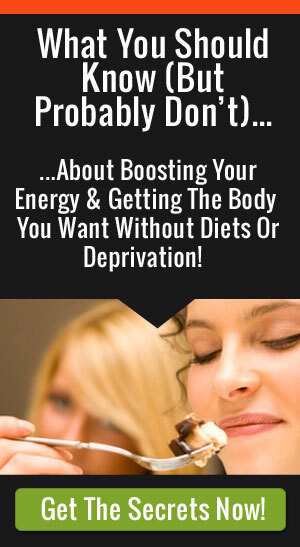 Find out which fruits and veggies are on the dirty dozen list. 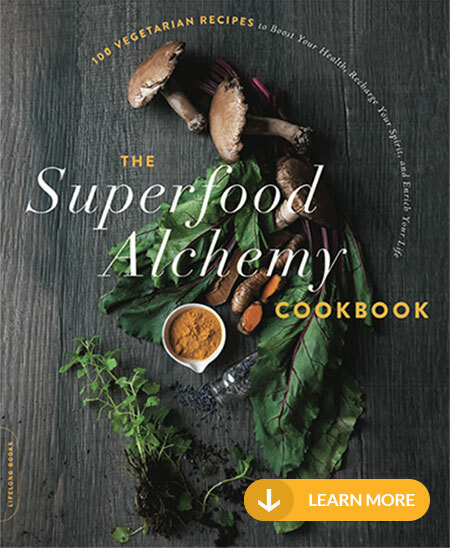 As a healthy cooking expert, health coach and TV host, Skinny Chef Jennifer Iserloh shows you how to eat healthy and delicious every day. 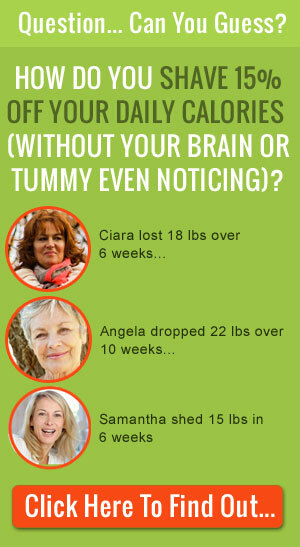 Join over 48867 people who get healthy eating & cooking tips each Tuesday!